Grandpa Listening in on the Wireless, this Norman Rockwell painting, appeared on the cover of The Literary Digest published February 21, 1920. This illustration was Rockwell's fourteenth picture featured on the cover of The Literary Digest. The Digest featured Rockwell artwork on the cover nine times total just in 1920 alone. The original oil on canvas painting, 22 x 19.5 inches or 56 x 49.5 cm, is part of a private collection. Norman Rockwell loved painting children, old people and animals. In this painting, we get two out of three of his favorite subjects. Grandpa Listening in on the Wireless was only one of 47 Norman Rockwell Literary Digest covers; here is the list of more Norman Rockwell Literary Digest scans. Rockwell usually painted illustrations topical to the current events of the day. 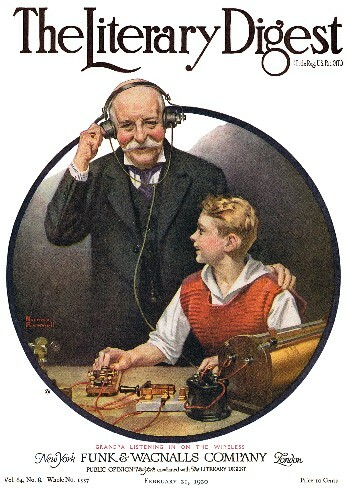 Radio was in its early days in 1920. We can assume that broadcast radio was just starting in the New York area where Rockwell lived because of this picture. While radio had been around for some time in 1920, it had not been utilzed as entertainment before this era. Radio had mostly been used for communications, like ship to ship. Grandpa and grandson are enjoying themselves listening to some new radio broadcast. Owning this new radio would be akin to being among the first to own a television during the 1950's. Judging from his beaming smile, Grandpa's program is coming through clear enough to understand what is being said. Grandson seems to be delighting in Grandpa's enjoyment as well. Rockwell was a stickler for authenticity. Therefore a radio set of the day looked exactly as it appears in this painting.